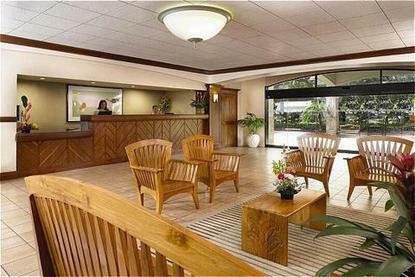 OHANA Honolulu Airport Hotel provides business and leisure travelers with affordable accommodations, just a half-mile from the Honolulu International Airport. The hotel is five miles from downtown Honolulu and eight miles from Waikiki, both easily accessible by car or taxi. OHANA Honolulu Airport Hotel is also a short drive from major military installations including Hickam Air Force Base, Pearl Harbor Naval Station, and Tripler Army Medical Center.All of the hotel's comfortable guest rooms have recently been extensively refurbished. Banquet and Meeting facilities can accommodate up to 200 persons. Enjoy relaxed poolside dining at Willoughby's Restaurant serving breakfast daily. The 24-hour reception desk and 24-hour complimentary airport shuttle service caters to the varied flight schedules of interisland, domestic, and international travelers.